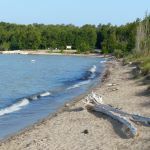 Ask fellow campers about "Inverhuron Provincial Park" and nearby attractions. There are four campgrounds in this park - one group and three individual. We were in Lime Kiln Campground. Registration took longer than expected due to only one staff on duty. The water fill up is just past the gate house and there are four places, some have hose connections and one is on the right side for those who need to fill up on that side. They are separate from the excellent dump stations which are near the exit. The back-in sites are mainly on the outside of the loop road while the pull-throughs are on the inside. The pull-throughs looked to be long enough for any size rig with the limitation being the roads to navigate due to overgrown foliage along the way. Our site was a fairly level, gravel back-in although it dipped down at the rear. The electric hookup was located in the forest between two sites and I had to use an extension to reach it. It worked fine. Garbage bins are located at the exit to each campground. Recycles are near the gate house. No OTA TV or Wi-Fi. Satellite wouldn't work due to the trees. I was surprised that there were not many bugs, but it may be past the peak season for them already. The Chain trail has access from all the campgrounds. It is for both pedestrians and bikers. There was a couple of other trails, but they were not accessible from the campgrounds. This campground is one of the better ones in the Ontario Park system. The best one for water fill and dumping that I have seen so far. I would definitely come back to stay here. We camped at Inverhuron Provincial Park in a Motorhome. Stayed for 4 nights. This is a nice beach and park, however their reservation system is not very good. Had to go there on opening day, to secure a lot. When traveling a great distance, this is not good. And: you cannot book 7 days in a row. 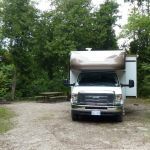 We camped at Inverhuron Provincial Park in a Travel Trailer. We moved here after a Very negative experience at a nearby campground so I was delighted at the privacy of the sites and the scenic trails, beach, and pioneer cemetery. I would have like to have a longer weekend to enjoy all that this park has to offer. Staff was friendly and helpful. This is an unexpectedly beautiful park. We will be returning next season for sure. We camped at Inverhuron Provincial Park in a Travel Trailer. Nice private lots. Poison Ivy in some areas. Very clean washrooms and showers. We camped at Inverhuron Provincial Park in a Fifth Wheel. Another excellent Ontario Provincial Park. We had a large group and occupied 3 sites in the Lime Kiln section. Sites 151,152,153 were excellent with plenty of shade. Two of them were pull throughs and were huge and could easily take big trailers. The bathroom facilities were new and spotless the entire weekend. The electrical hook ups were far from each site so bring plenty of extension cord. There are no water or sewer hookups. The beach was excellent and included a separate area for dogs. The kids had a blast playing in the shallow water. My only complaint was that there is no playground structure but that is not a big deal. We camped at Inverhuron Provincial Park in a Tent Trailer. Are you affiliated with Inverhuron Provincial Park ?